Gossip Stone: Should Dungeons Be So Heavily Themed? 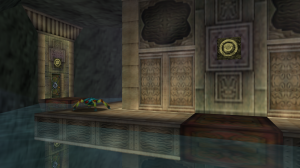 When asked which dungeon in the Zelda series is most enraging, most people tend to say “the Water Temple”, referring to the one in Ocarina of Time. Though, hearing that, some people may ask, “Which water temple? There are a whole bunch in the series.” This is a true fact regarding several “themes” of dungeons in Zelda games. Fire, ice, water, forest – the list goes on. 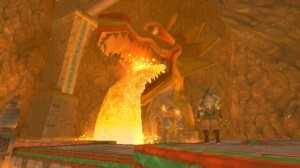 Each game has specific elements that it bases most of its dungeons on. Is it right for there to always be such set themes for dungeons? Should there be more variety and creativity? Join the discussion after the jump! To be clear, I do not think that is is wrong to have dungeons that are based specifically on the elements. In, say, Ocarina of Time‘s case, it was pretty much necessary for the story of the Spiritual Stones and the seven Sages. Other than that, though, while Nintendo does find neat ways to make similarly themed dungeons different and varied, the non-themed ones really show off Nintendo’s creativity. Some of my favorite dungeons in the series are not exactly themed in any one way, like Minish Cap‘s Dark Hyrule Castle, and Forsaken Fortress. Even ones that combine the themes of other dungeons, like Ganon’s Castle from Ocarina of Time, or Sky Keep, are much more interesting, and manage to have their own creative gimmicks. The key here is variety. Having dungeons that are of the same theme so many times, while still being effectively varied, tend to have certain things that you expect to appear. Something is definitely lost in that predictability. Hopefully, in “changing the conventions of Zelda”, Zelda Wii U will have consistently creative and unique dungeons, that are not so obviously themed. What do you guys think? Do you think Zelda games should still have dungeons based on certain elements, or should they be more creatively themed?